Imaginative with multiple plot twists. This is how I summarize The Snow Globe by Jenna Nelson. SUMMARY (from back): By day, Sondrine Renfrew works at Cimmerian’s Curio Emporium, her aunt’s apothecary and antique shop in London, 1875. By night, she weaves fire, water, and air into both inanimate objects and living creatures. 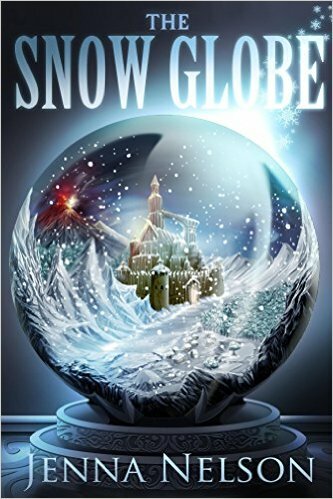 When a hooded stranger offers Sondrine a snow globe in trade for medicinal herbs, she accepts, enchanted by the castle, forest, and sea encapsulated under the glass. Sondrine soon discovers her arrival in Winterhaven is no accident. There, she meets Shán, a man who broods more than the darkened sky above. Turns out Shán is not to be trusted. Not only is he the man who sold Sondrine the snow globe, he is a bounty hunter employed by the king. The beginnings of a sovereign war have been set in motion and an Immortal queen, one who uses fire as a weapon, is set on destroying Winterhaven. Because of her Elemental gifts, only Sondrine has the means to stop the queen. If Sondrine refuses the king’s request, he will behead her. If she rises to the challenge of killing the Immortal queen, her death is just as imminent. After all, an Immortal queen cannot be killed. WHAT I THOUGHT: I was drawn to this book because of the premise that an entire world exists within a snow globe. Unlike Alice in Wonderland though, the main character, Sondrine, doesn’t have to fall down a rabbit hole to arrive. This is a debut novel and as such had sparks of brilliance mixed with some points that betrayed the author’s newness. So then, for the characters, initially we meet Sondrine who seems spoiled and petulant, running away from an arranged marriage at the hands of her nasty aunt. I wasn’t sure if I’d like her to begin based upon who she is initially set up to be. She is a misunderstood Elementalist in London in the late 1800s. As the narrative moves forward though, the experiences she endures make her grow up quick and she begins to be more appreciative and more discerning. The author also attempts a Snape-like character named Shan who one questions which side he is on. I thought this was carried out with fairly good success with the details woven throughout that have Sondrine, as well as we readers, second-guessing his true alligience. The supporting characters like Zhang the Elder, Lark, Snap and others were fun additions to support the quest of freeing Winterhaven from the evil queen. Which actually brings up the question of why the queen wants to destroy the world of Winterhaven. She has a way of staying alive eternally, why must she try to destroy it? As world-building goes I am on the fence as parts were absolutely brilliant, but others I felt like too much detail was described that served to confuse me rather than enhance. Some of the scenes, while vividly creative, seemed just too wild to be believable. I think some of these might not have been necessary to move the narrative along but a short mention of time passing would have sufficed for the purpose. In my view, this is just a “first” novel issue though and I fully expect the author will grow in her craft making these infrequent in the future. One point I would have liked to see addressed in this first book in the series: we are not told how Winterhaven actually came to be within a snow globe…and that is one piece of detail that needs to be revealed for this narrative to make complete sense, especially with the close interplay between the worlds of London and Winterhaven. One complaint I did have: The author set up a conflict with an evil queen early on in the book and grows it, but I have to say I was disappointed at how quickly and seemingly easy it was for Sondrine and Shan to eliminate her…unless they didn’t really succeed, which, if that’s the case, I guess we are left to find out in the next book. That was not made clear. Overall, this was a fairly well done debut novel and as such had sparks of brilliance mixed with some points that betrayed the author’s newness. I loved where the author is going with the story arc and feel confident that as she matures in her craft, this world will get even better!